There are bunches of kale ready to eat in someone's garden right now. What are you going to do with it all? Can you name another food gives you a whopping 350% of your daily allowance of Vitamin A per serving (and 11% of your iron, too)! True confession - I hate kale, BUT, after I tried this I decided I liked kale. There is something about adding olive oil that makes vegetables taste good like with the Green Beans with Olive Oil. The recipe is really simple, and kale is readily available this time of year. 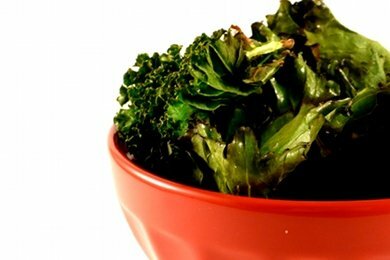 It is crunchy and delicious and you find that you can eat an ENTIRE bunch of kale without noticing. My kids will even eat kale with this preparation (something about salty crunchiness that stops the "EEEWW its GREEN" response). The Eat More Kale movement started in (guess where?) Vermont. I have seen a few cars driving around with "Eat More Kale" bumper stickers. I have to admit that there is probably no better food for you than Kale. It is an absolute SUPERSTAR in terms of nutrition. Preheat oven to 375 F. Line rimmed cookie sheets (also called hotel pans) with parchment paper (see note below). Tear the leaves off the thick stems into chip sized pieces. An easy way to do this is to fold the leaf in half and just rip toward the stem. Spread pieces out on cookie sheets. Drizzle with olive oil and sprinkle salt to taste. Bake 8 minutes or until edges are brown and kale is crispy when moved in pan. If you don't have parchment paper, you can use aluminum foil or neither. The idea here is to make clean up easy (just toss the paper and then you have less work to do). What are you going to do with all that kale? I have always been so intimidated by kale. Maybe I will buy some today! I love kale! I've made a version of these a few times. Yum. This sounds yummy!!! Can't wait to try this. These sounds yummy!! Going to try them later today!! Never knew what do do with Kale, except feed it to my bird ~ she seems to like it! This sounds quite interesting, will pick some up at the Farmer's Market tomorrow and try it ... anything for a little green! Actually I am one of those crazy people who has always (even as a very young child) loved greens. But this way is fun and I feel like I am cheating. YUM! How do you store the leftovers and how long can you keep them? I put them in a plastic container outside the fridge. They would be good for 3 days? They never last that long at my house. Hmmmm......I will reserve judgement until I try it, but Kale soup? eeeeewwww! I love these chips so much they are gone in 2 days.I sprinkle with rice cheese parmesan since I do not eat dairy.And I store in a pop side closure plastic. Yes, a great way to get Kale into your kids' bellies! My 1st response is "ewwwww", but that was also my first response to the cauliflower as french fries you posted a few weeks ago...and they were AWESOME! (and I don't even like cauliflower) So, I'm going to try this ASAP. My husband and I were just talking about ways to get more green, leafy veggies! Thanks for the post!! I made these chips months back- awesome! But KAle IS awesome! I make these in the dehydrator and they are awesome. My blog has a post on KALE shirts!! It's time to advertise for Kale. I eat a lot of kale in salads and soups, but never heard of toasting it for snacks. What a great idea! So how many points+ would this be - have to allow for the 2 tsp. of olive oil, right? JaneG, I am doing pointsplus too and I think all you would count is the point per tsp of olive oil. The Kale itself would be "free". I am so scared to try this, but from all the comments, I am going to have to give it a fair shot!